Brut Classic is a fragrance designed for strong and confident personalities. 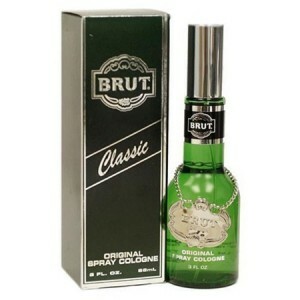 Brut Classic 88ml. Eau De Cologne - skillfully combines notes expensive spice and fine essential oils. In the composition together harmoniously spicy anise, subtle lavender, sweet vanilla, sandalwood, basil, geranium, bergamot, jasmine and patchouli, creating an unsurpassed flavor. Especially good is this fragrance for evening cultural events. True gentleman lurking in every man and therefore this brand produces spontaneous desire and sudden sympathy. With the guarantee of 100% can be argued that even after 100 years, this fragrance will be maddening. Story of a famous classic Faberge, flavor Brut Classic for Men, began in the mid 60s to create a special line of cosmetics for men, which includes fragrant balms and lotions, shaving foam, deodorants and colognes. Half a century later, Brut Classic has not lost its uniqueness and style, and their true appearance of this man's character. Easy and elegant, Brut Classic embodies the main features of its owner - the power, courage and nobility! Song: lavender, anise, lemon, basil, bergamot, geranium, ylang-ylang, jasmine, sandalwood, fern, vetiver, patchouli, oak moss, vanilla, tonka bean. Fragrance created in 1964.